The TGU… is it worth it? Yes! I like this article and I certainly like the exercise! The Turkish Get Up is a simple but extremely effective all-body exercise. Its usually done with a kettlebell, but if you don’t have a kettlebell then any weight will do, just make sure it has a safe way to grip it as the last thing you want to do is drop the weight on your head as your get tired!! If you are not sure of the format of the exercise from the article then there are a load of video demonstrations on YouTube. If you have never done the exercise before, then take it steady and be aware of how you feel as it gets very tiring very quickly! Have fun with the TGU!! A HM Treasury spokesperson said: “He introduced a new levy on the soft drinks industry to pay for a doubling of dedicated sport funding for every primary school in the country, a huge expansion of breakfast clubs to ensure that every child gets the best start to the day, and new funding for a longer school day. How will it pay for all those things, and the list of things seems to be getting longer, if the manufacturers reformulate their products to avoid the tax? Yes I agree, and you are the start. Finally!!! U.K. Budget announces sugar tax. “Osborne announces a new £520m levy on sugary drinksOsborne turns to child health. A child age five eats their body weight in sugar every year, he says. He says some manufacturers are addressing this. Industry can act and, with the right incentives, it will. He says is is not prepared to do nothing. A sugar tax to be introduced on the drinks industry. It will be introduced in two years time, so they have time to change. There will be two bands. Pure fruit juices to be excluded. The government will consult on this, he says. He says manufacturers can choose if they want to pass the price onto consumers. Sugar levy to raise £520m. 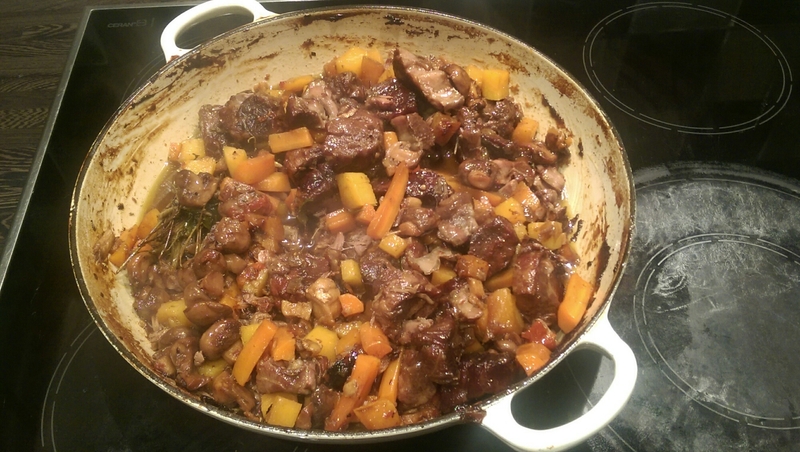 A good warm lamb stew to keep winter out and warm you from inside. 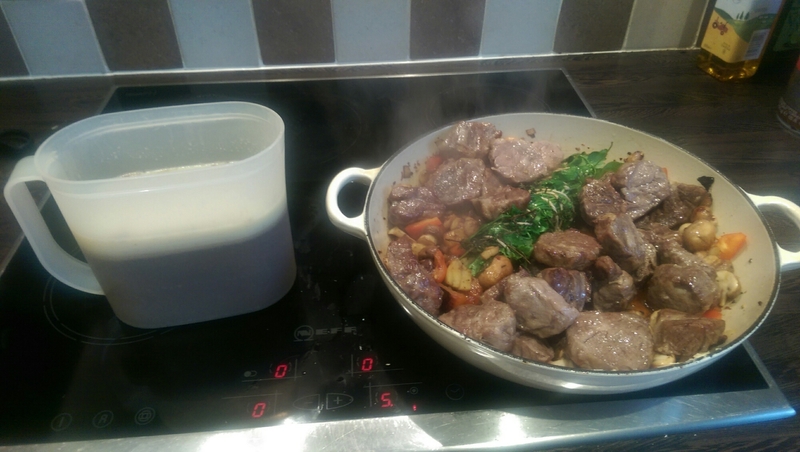 I use lamb neck fillet because if you cook it long and slow it becomes meltingly soft and has a good flavour. I used a kilo and the butcher sliced it for me into one inch slices. Not cheap, but it did six meals and was so good! By the way, the longer you leave it before eating it, the better it gets! 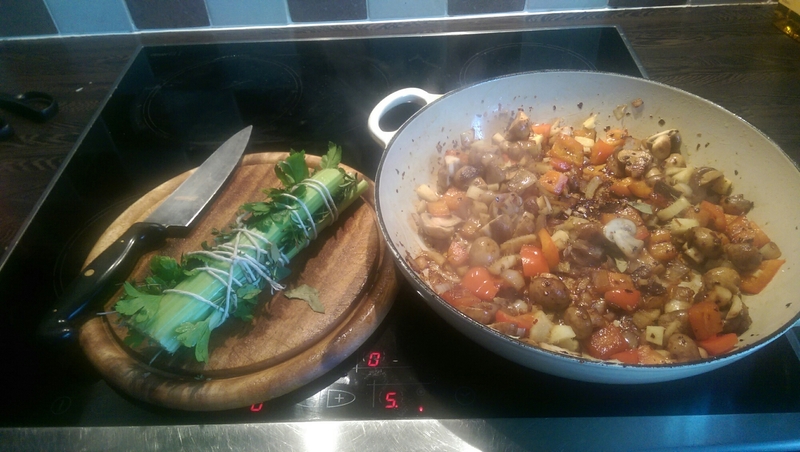 I started by sautéing some onion, garlic, mushrooms, chillies and small diced ginger in the casserole. I made a bouquet garnis with celery and whatever herbs I could find in the garden. There are still herbs even at the end of a UK winter – parsley, rosemary, sage and winter savoury. The lamb was roasting and browning in a very hot oven until the flavours of the onion and mushrooms and ginger were developed. Then combine . 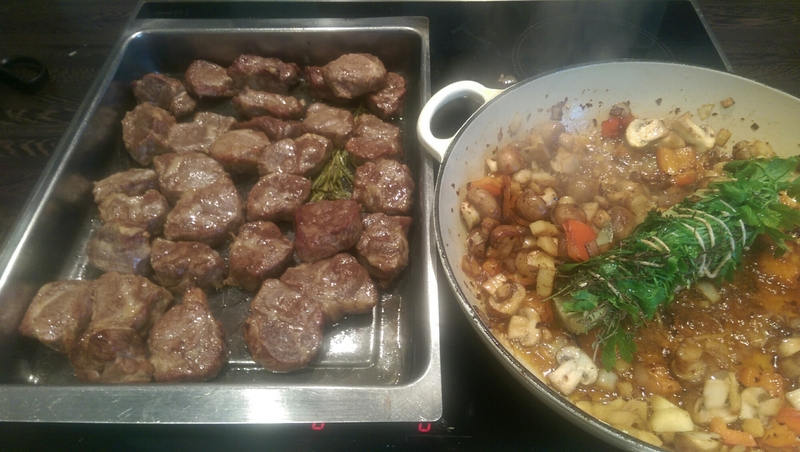 I then added some of the best lamb stock ever – thanks to my butcher for the lamb bones – and of course some red wine. Look how strong and solid it is. 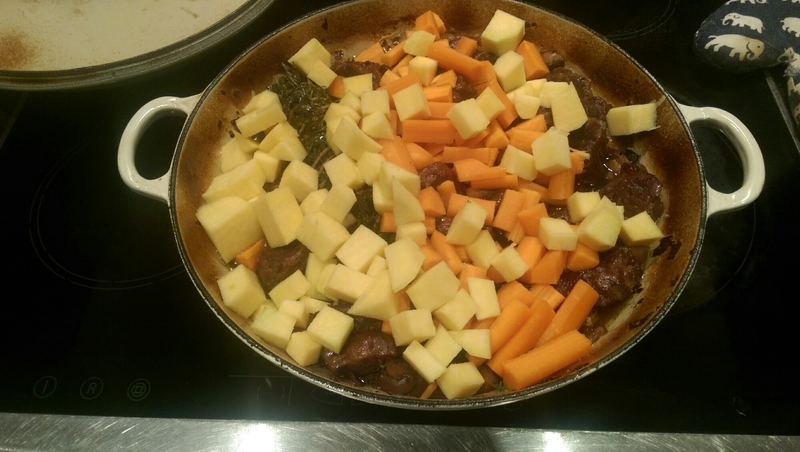 Next come some winter root vegetables, just what ever you want. I had swede and carrot. Then cook long and slow. 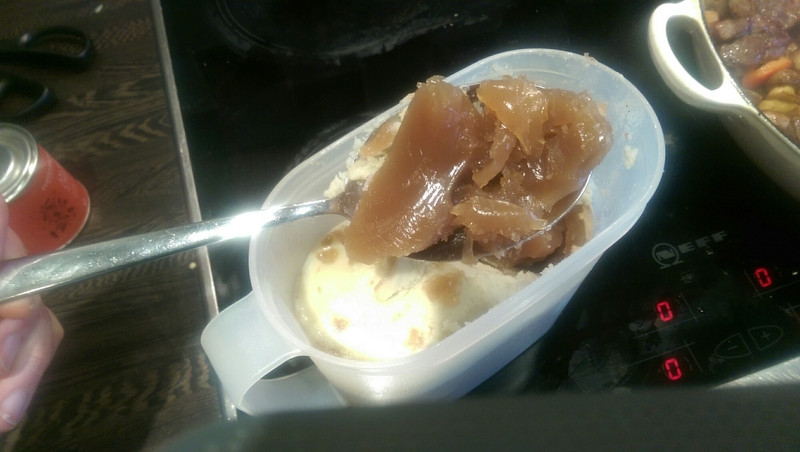 I cooked it in the oven for four hours at 145C. 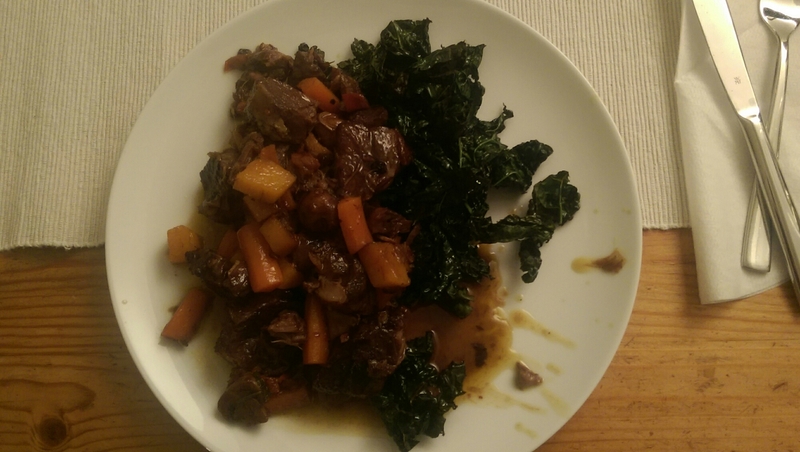 And here it is with roasted black kale. Sorry about the messy presentation, I was hungry and it was delicious! !